There has seemingly been a lot of chatter floating around lately about how the NHL as a collective is getting younger. Whether it’s due to salary cap restraints or a changing game that generally demands more athleticism from its players than ever before, the fact of the matter is that teams are divvying up a larger portion of the pie to their more youthful assets. We’re seeing that first-hand in Vancouver this season. While there’s room to quibble with how they’ve been used on occasion by the coaching staff, there’s no denying that the Canucks are embracing the league-wide youth movement with the quartet of players 22-or-under playing important roles for them early on. Even with these philosophical adaptations by the organization, though, for the Vancouver Canucks everything still begins and ends with the Sedins. The more things change, the more they stay the same. Willie Desjardins has done a better job recently of balancing out his deployments and taking his foot off of the gas pedal, but the burden both Henrik and Daniel Sedin continue to shoulder at this point of their careers remains extraordinary. It’s not all that common to see players in their 15th campaign and age-35 season pace their team’s forward group in usage like they’re currently doing (particularly at even-strength). Martin St.Louis is just an absolute freak and we quite frankly may never see a player like him come through the league again. But beyond that, as things currently stand both Henrik (14.0) and Daniel Sedin (14.1) would make the cut this season health permitting. As impressive as their shared durability and raw workload continues to be, the important distinction here is that their actual output during that time hasn’t really fallen off. The video game point totals from those ’09-’11 glory days are gone and they’re not coming back, but in reality no one is actually reaching those sorts of figures anymore. Just last season, only 8 players reached the point-per-game plateau and only 17 players hit 70+ points. Expectations for this new incarnation of the NHL need to be adjusted accordingly for those arriving late to the party. The one giant elephant in the room has been and continues to be Daniel Sedin’s rapidly evaporating effectiveness as a finisher, which is attributable to some combination of the natural decline we expect to see from shooters and the after-effects of Duncan Keith attempting to decapitate him. This is now his 4th season of a noticeably below average conversion rate after years of being boasting a shooting percentage comfortably in the double digits. 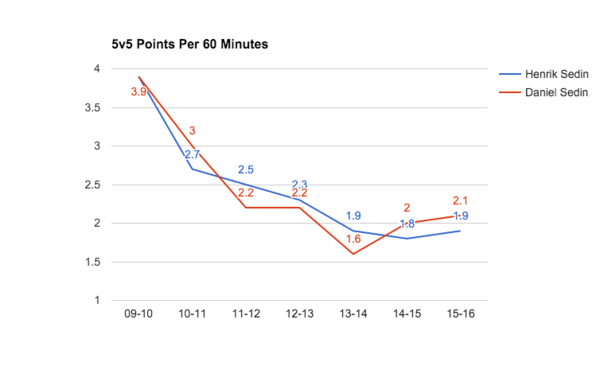 While the league average for forwards has settled in somewhere around 10.4-10.5% it looks like Daniel’s new baseline is around 9%. That’s a difference of roughly 4 goals a season given his level of shot generation. Its gotten to the point where he has needed to experiment on occasion with creative new ways of getting the puck past the opposing goalie. That’s just the nature of the beast with aging offensive players. Fortunately for both them and the Canucks, even when the offence hasn’t necessarily been there they’ve still maintained their stature as territorial monsters. Despite not benefitting from the absurd zone start totals which they once did for a while now, they’ve managed to continue to consistently drive play and tilt the territorial battle in their team’s favour. This season they’ve been doing everything in their power to drag what can only be described as a middling possession team – currently sitting at a 49.7% Score-Adjusted Corsi – along for the ride with their respective 54.88 and 53.74 percent possession rates. There will be nights where the battle will be more uphill than it used to be for them a few years ago. They might not be able to rear back and throw their fastball like they used to during their peak. In totality though, they endure as not only their team’s most productive players but legitimate NHL first-liners as well by any objective measure. It’s impossible to say just how much left they have in the tank, but at this point I’ve learned to stop betting against them. After all, there are only so many times we can all incorrectly wonder whether they’re in a different phase of their career before we just take a step back and marvel at their sustained excellence. They’ve only been doing it over for a decade now. I don’t think I have ever seen two franchise players, that produce, are model citizens being asked when they are retiring more? They are 35, not 45 and it’s been years since they had a regular winger to play with! I’ve got my money on the Sedins playing until they’re 40, barring serious injury. I completely see this scenario working out and with the youth movement we are currently witnessing this is where their mentoring and leadership is going to be relied upon more than ever. They can easly transform into perimeter and PP specialist’s type players without jeoprodizing the teams transition going forward with the next generation. The twins were innovative and caught their opponents by surprise on a nightly basis for over a decade but this is a tough league with much video analysis. What we saw last night with Hansen was that they need a little help and that`s the clue for the power play woes. They need someone in the slot consistently looking for rebounds and a steady point shot. I think Shinkaruk and Subban could run this PP better given the chance. To your point about the PP, I honestly thought that Weber’s RH shot on the point, and the threat of same, would pick up the PP. It’s not looking like that was a correct assessment, with Weber looking about as snake-bit as Cleopatra. I’m beginning to wonder if the PP wouldn’t be better served with a LH playmaker at the left point setting up a LH shot at right. That would create an opportunity for quick puck movement against the flow & a fast release from the point, or bouncing the puck down low again, against the flow. Daniel at point, feeding Honeybadger/Vrbs in low slot or Edler at point? Does anybody track offensive zone pass completion rates? As much as zone entries, I would imagine that this would be a worthwhile marker of offensive success. I would also guess that the Sedins’ game would score at the top of that kind of chart. Thank you for this article. Everytime I hear some idiot bashing them or their age, I will send them this article with a big “f- u” note attached to it. Forget what amazing hockey players they are. How innovative they are every season. The people off ice are the real stars. These guys have done, and continue to do everything for this community and province. They’ve donated more money to this Provinces charities than any other NHL er (short of Subban) in this country. And they aren’t even Canadian. They are actual role models, there’s NEVER bad stories about them in the community. They are even better teammates, everyone short of of Duncan Keith and Jamie Benn love them. The league will never see 2 great guys like this ever again. Cause the world just doesn’t consistently produce quality people like them any more.